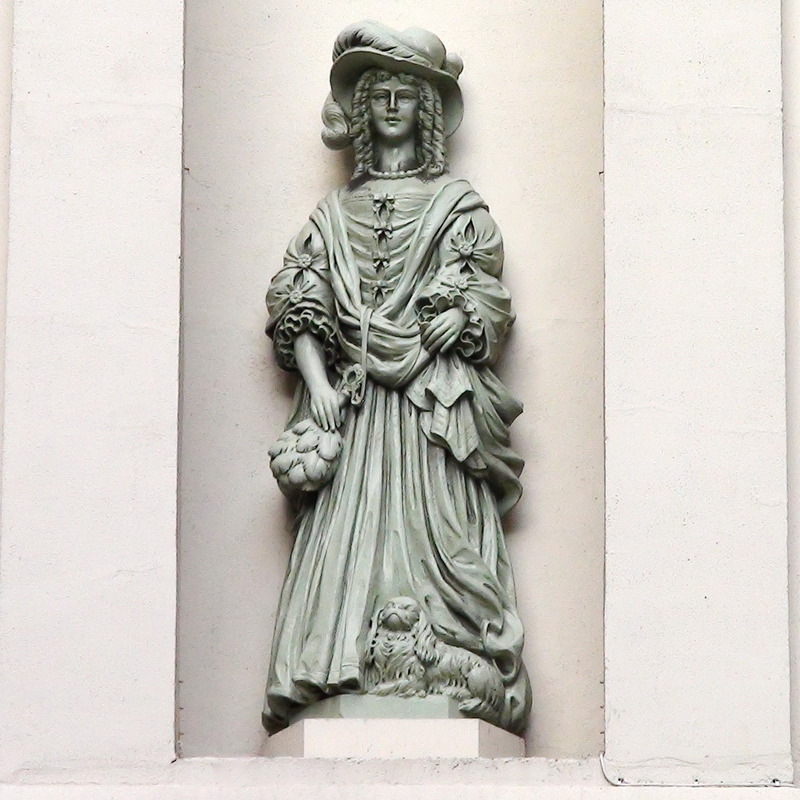 We have failed to garner any information on this statue and the relief panels. The nearest connection we can find with Nell is a tradition that she lived at Sandford Manor House, still marked on the (Google) map, just north of the Chelsea gas works near Chelsea Harbour; not exactly close. 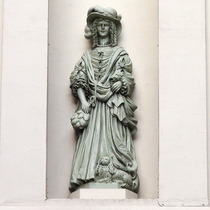 And yet the fountain in nearby Sloane Square also carries images of Nell and her King, so there is some connection to the locality. We'd also like to know the sculptor. Note the dog at Nell's feet. As Corgies are to Elizabeth so these spaniels were to Charles II. This art deco apartment block has a very distinctive frontage. The large canopy above the entrance is probably not part of the original design since it partly obscures the relief above. From further back one can see that this depicts, a rural scene with, left to right: two cavaliers resting on their swords, two saddled horses, another cavalier with two ladies. Below the canopy, above the revolving door, a curved relief depicts: a rural scene with, left to right: a group of 4 cavaliers, one with his sword drawn, a castle, a pair of duelling cavaliers, a group consisting of a person in a long robe (a woman? ), a cavalier, a less formally-dressed person (a squire?) and two greyhound-type dogs. This must all reference some legend or historical event but it's beyond us. Anyone know?